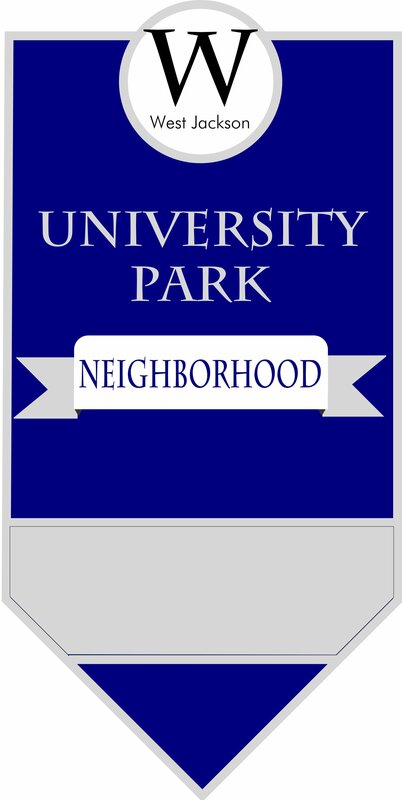 Rendering of the University Park Neighborhood Sign that will be unveiled this Wednesday at 10 a.m. at BankPlus. It is hoped that this sign will serve as a model neighborhood entrance marker for other West Jackson neighborhoods. For those unfamiliar with the area, West Jackson probably seems like a collection of neighborhoods. Not only may it appear to be a collection of neighborhoods, it seems to be a collection of UNIDENTIFIED neighborhoods. If you drive through a suburban neighborhood, the entrance of the development lets you know whether you’re in subdivisions such as Reunion (Madison) or Byramdale (Byram). However, if you come to areas in West Jackson, there is no signage that indicates that you are entering the neighborhoods of West Park, Pecan Park, or Mathews Estates among others. Hopefully, this will soon change. On this Wednesday, November 3rd, at 10:00 a.m., the West Jackson Community Builders Leadership Institute (CBLI) will host an Unveiling Ceremony for the University Park Neighborhood Sign. The ceremony will take place at the West Jackson branch of BankPlus at 912 Dalton Street. BankPlus has graciously allowed the sign to be posted on their property and will provide refreshments for the event. Speaking of University Park, The University Park Neighborhood is an older West Jackson neighborhood that consists of a mixture of single family homes and duplexes. Although the neighborhood is located behind the newly-constructed One University Place, it is not to be confused with the development. CBLI is an organization that was started by Dr. Bill Cooley, Dr. Pamela Moore, and the JSU Center for University-Based Development to address specific issues in West Jackson through the administering of “mini grants.” CBLI is funded through the National Community Development Institute–a nonprofit organization founded by Dr. Frank J. Omowale Satterwhite to address capacity building and organizational development in communities of color. The result of one of these grants is the creation of a neighborhood marker for the University Park neighborhood that CBLI hopes will become a model marker for other West Jackson neighborhoods. The purpose of this marker is to establish identity for the various West Jackson neighborhoods while simultaneously unifying these neighborhoods through common signage. The sign that will be unveiled this Wednesday is located at the corner of Dalton Street and Isaiah Montgomery Street in a landscaped area of BankPlus. The design of the neighborhood sign that will be unveiled Wednesday is the result of the efforts of a Fall 2009 Urban Design class in the Department of Urban and Regional Development at Jackson State University. Dr. Evandro Santos’s URP 541 class, which consisted of Shauncey Battle, Bryan Grove, Justin Fritscher, Andrea Sims, Curnis Upkins, III, and Heather Wilcox, walked and drove through some of the West Jackson’s neighborhoods and interviewed some residents of West Jackson to determine the type of signage that would be appropriate for the area. The resulting sign is composed of cast aluminum and resembles a state historical marker to indicate the historical significance of many of these older neighborhoods. This sign is intended to mark the entrance to the University Park Neighborhood and we hope that future signs will do the same. The sign was ordered through Budget Signs, a business based in West Jackson and located on the Highway 80 Corridor. We hope that you can join us for this event! All community members and those interested in the development of West Jackson are encouraged to attend. Feel free to spread the word. UPDATE: If by chance it rains during the scheduled ceremony time tomorrow, the ceremony will be held at Epiphany Lutheran Church (corner of Dalton St. and Isaiah Montgomery St., next to BankPlus).